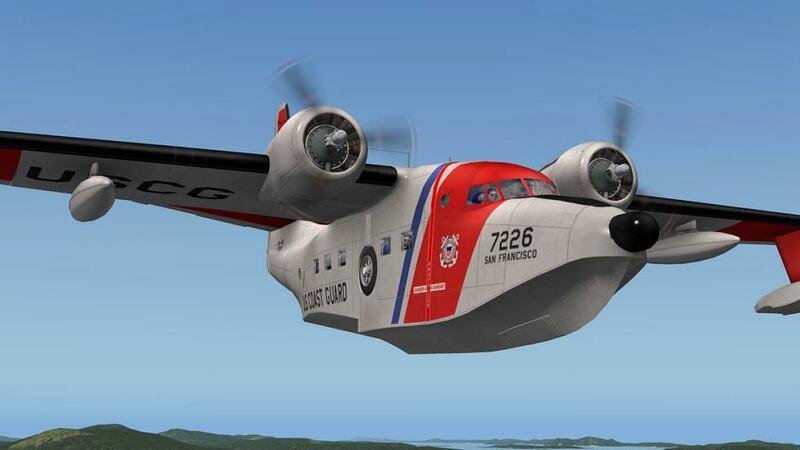 The Grumman HU-16D Albatross was a military development of the Grumman G-73 Mallard that was primarily used as a search and rescue and combat search and rescue aircraft by the U.S. Air Force, the U.S. Navy and the U.S. Coast Guard. 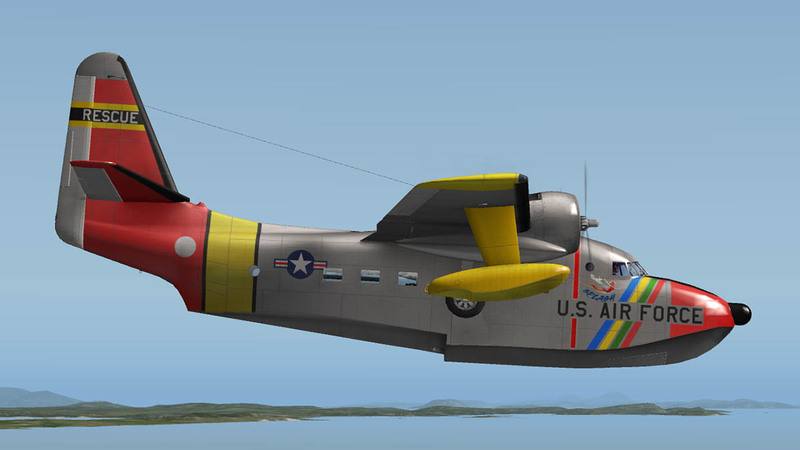 Originally designated as the SA-16 for the USAF and the JR2F-1 and UF-1 for the USN and USCG, it was redesignated as the HU-16 in 1962. 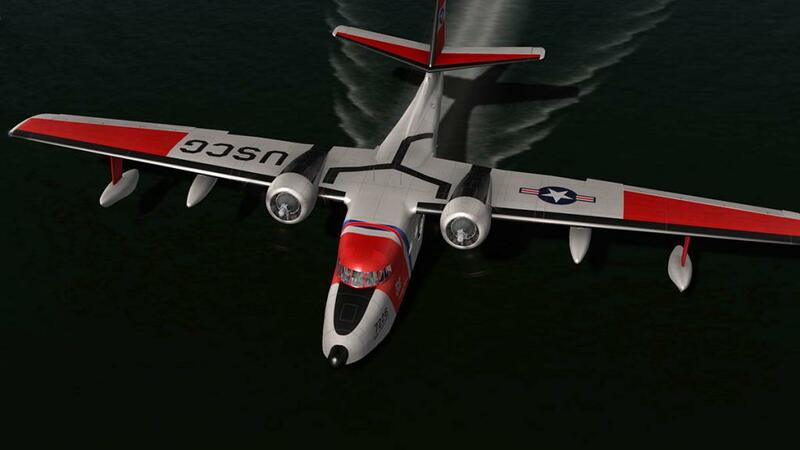 The aircraft is a large twin–radial engine amphibious flying boat, and with its deep-V hull cross-section and substantial longer length hull enabled it to land in the open sea. The Albatross was designed for optimal 4-foot (1.2 m) seas, and could even land in more severe conditions (with assisted jet-takeoff). 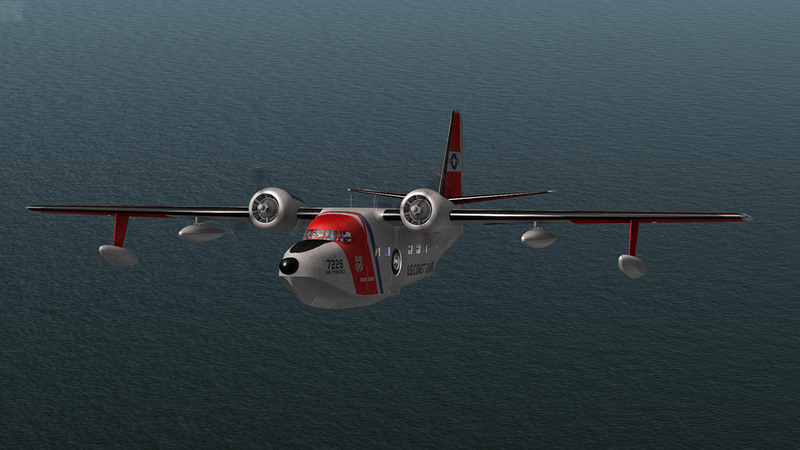 The USAF version the SA-16 was used extensively in Korea for combat rescue, where it gained a reputation as a rugged and seaworthy craft. 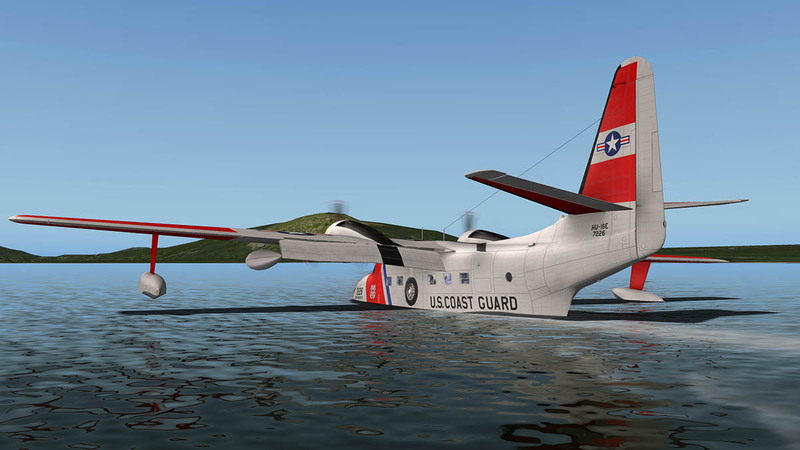 Later, the redesignated HU-16B (long-wing variant) Albatross was used by the U.S. Air Force's Aerospace Rescue and Recovery Service and saw extensive combat service during the Vietnam War. 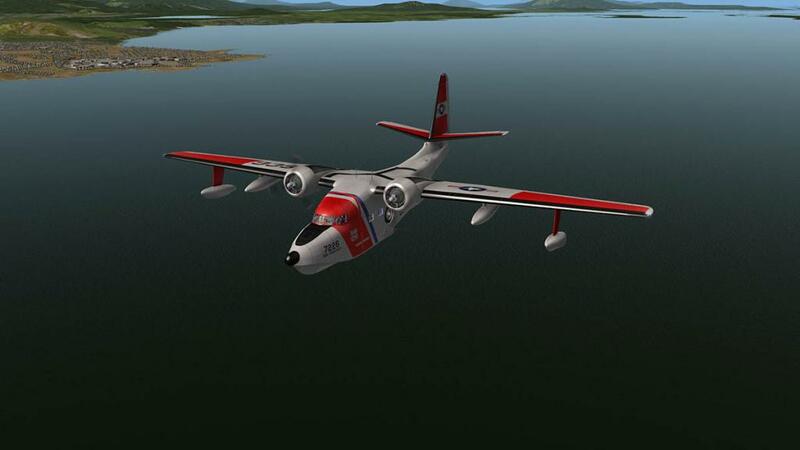 In addition a small number of Air National Guard air commando groups were equipped with HU-16s for covert infiltration and extraction of special forces from 1956 to 1971. 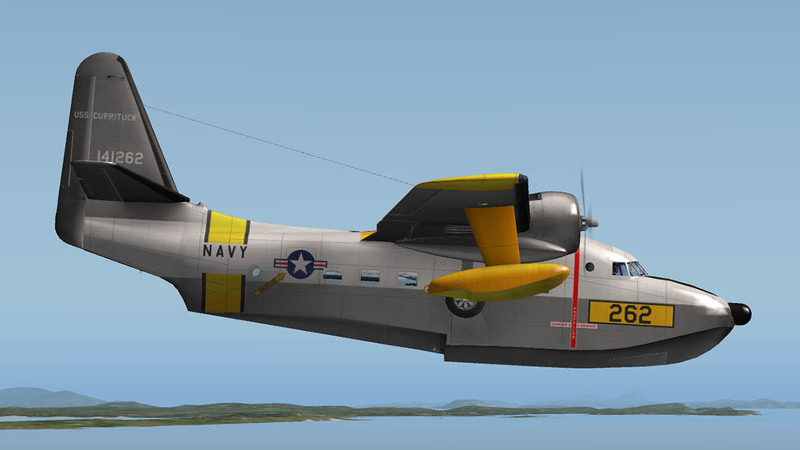 It was also employed as an operational support aircraft worldwide and for "skunk runs" from the former NAS Agana, Guam during the Vietnam War. 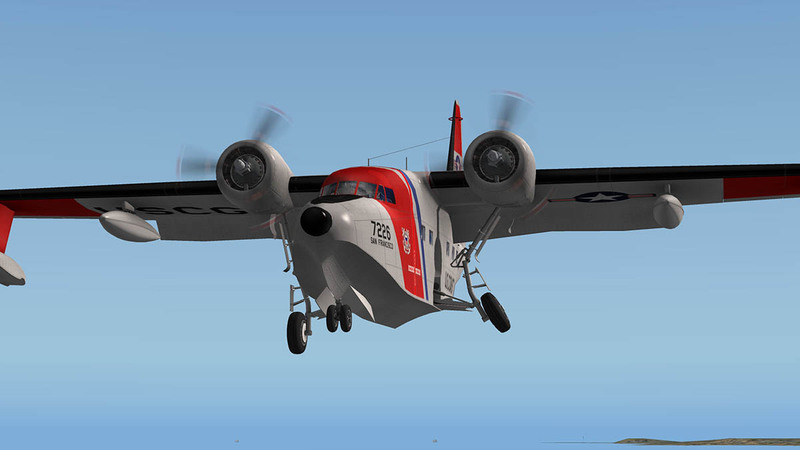 First flight of the Albatross was on the 24th October 1947, and the aircraft was manufactured between 1949–1961and the number built was 466 aircraft. 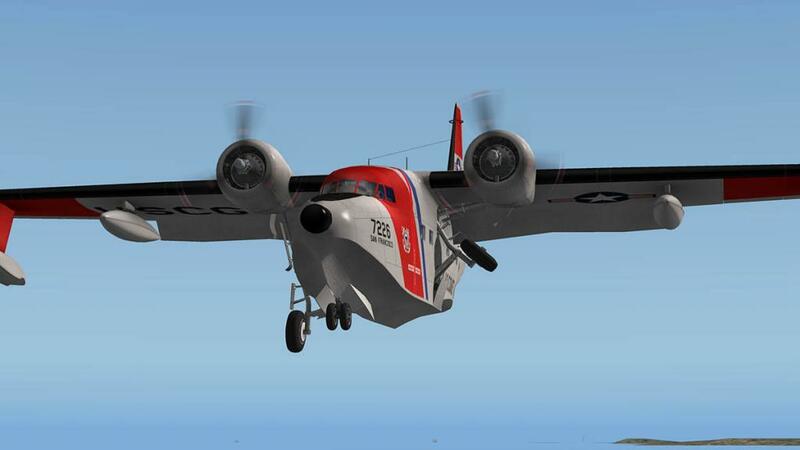 As developers both HydroZ and Khamsin are both well known to X-Plane with their respective aircraft in the Pottier P130UL "Bleu Citron", Consolidated PBY-5A from HydroZ and the B-25 Mitchell, Chipmunk, Munda (WW2) airfield, T-28 "Trojan" and various Laminar Research projects like the Oil Rigs and USS NImitz/Perry Class ships from Khamsin. 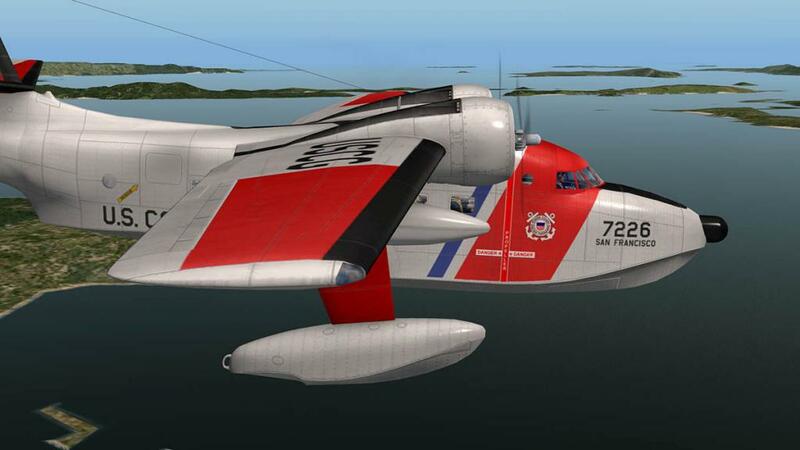 Both are hugely talented and here on the Albatross they combine their strengths to create this classic flying boat. 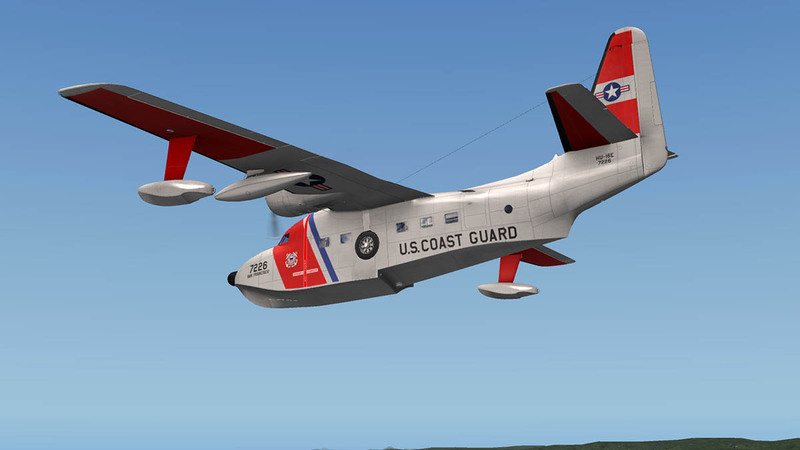 The modelling of the HU-16 is excellent as expected from both developers, really great detail on an aircraft which is quite stubby in profile. You need the selection of the "draw pixel per lighting" checkbox "on" to see the great riveting and structural (hull and wing) detailing of which on the hull is excellent. However the "draw pixel... " gave me quite a hit in framerate while switched on with my 512mb graphic card, dropping the "texture resolution" down to "Normal" did offset most of the hit cost. So you have to be aware of your graphic boundary (In my case 512mb) as if the aircraft goes over it drops the framerate quite hard. 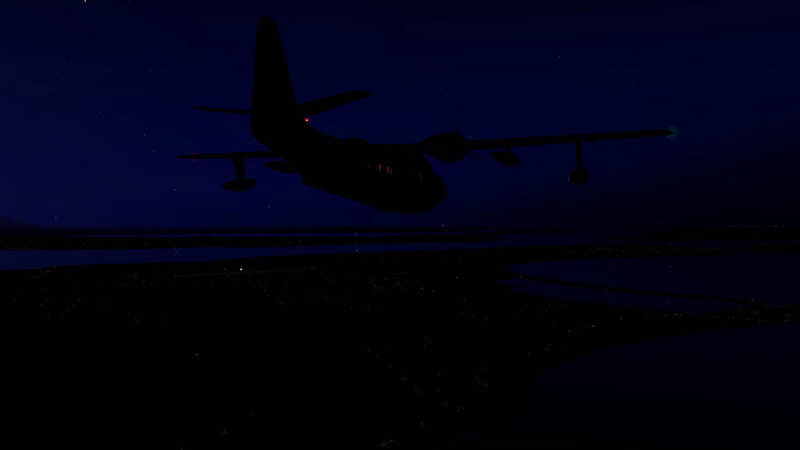 The actual loading of the aircraft is only 212mb, so you do have a fair space to play with, keep it within the boundary and the aircraft is however very good in and around the framerate (61fr) and even HDR can be used easily as well. 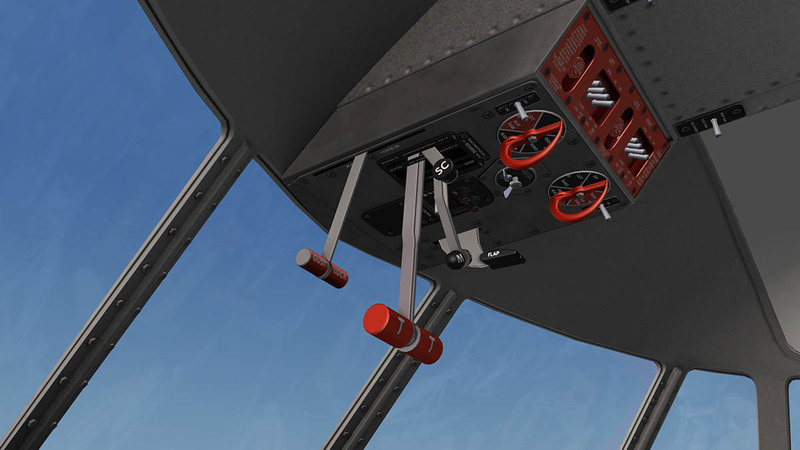 The highlight of the HU-16D is the landing gear, brilliant animation as it unfurls out of the sides of the aircraft and this is certainly a full sets of complicated landing gear to create and animate. It is clever and fun to activate and the struts and links are a marvel. There is not a lot of dirtying down close up, but it is very well done. 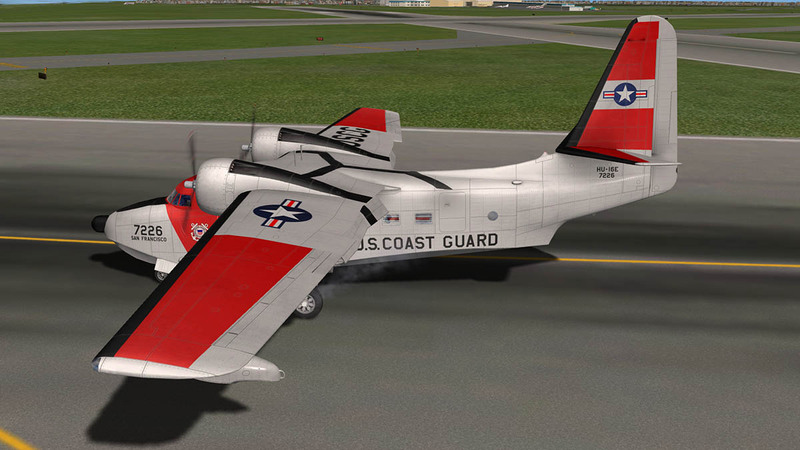 The front wheel in real life is a castoring wheel, but it does not quite come off in X-Plane, you can try to turn via the engines or in real life by the brakes (Left or Right) and that is why it does not work very well, the update will go back to standard X-Plane (yaw) turning system (note this has been done in v1.1. 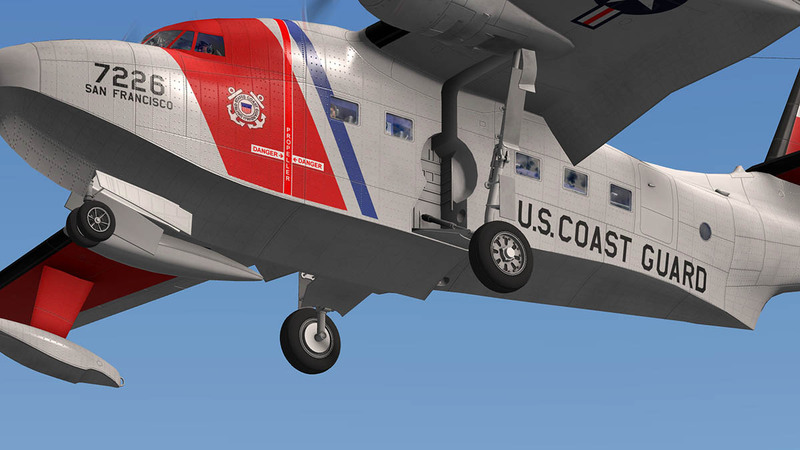 As a second note Laminar Research has updated the castoring function for v10.30). The strangest thing was I couldn't find any doors or hatches to get in or out of the Albatross?... There is a couple of panels above the pilots and hatches up on the rear of the fuselage and a panel in the rear roof, but none can be seen from the inside or are removable? 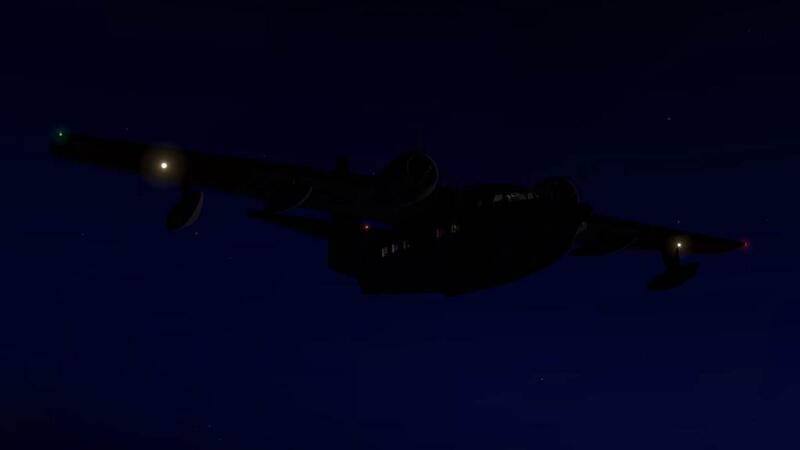 To understand this aircraft and its functions and to get the best out of flying the machine, is to understand its role. 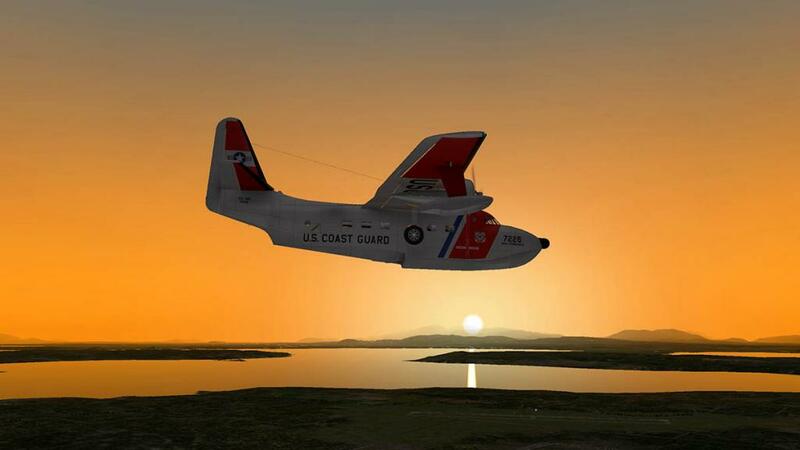 The primary mission is to fly way and far out to sea to find downed airmen or lost boats. And then when you get to the area you then need to stay on station for a period of time. 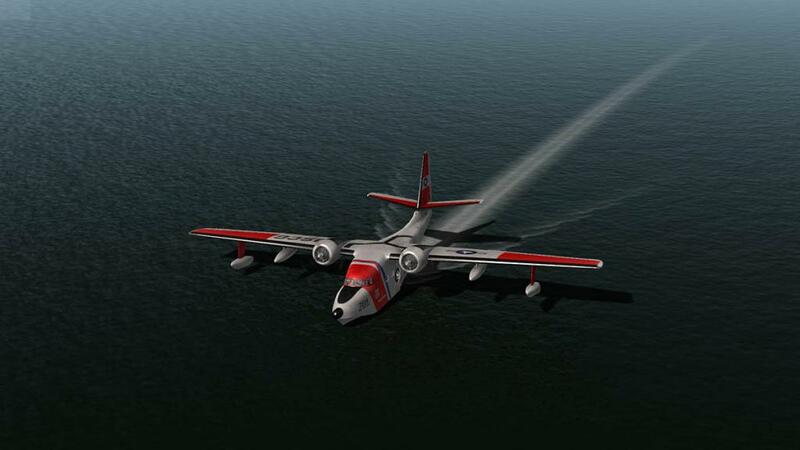 The range is huge at just under 2,500nm but the flying speed is only about 150knts -140knts flat out. At that speed and that huge range you are going to be gone for a very long time. But if the area is quite close it does mean you can stay on station out there at a very low speed for a considerable amount of time if you need to search out a large sea area. The aircraft is also brilliant for island hopping and tourist areas. 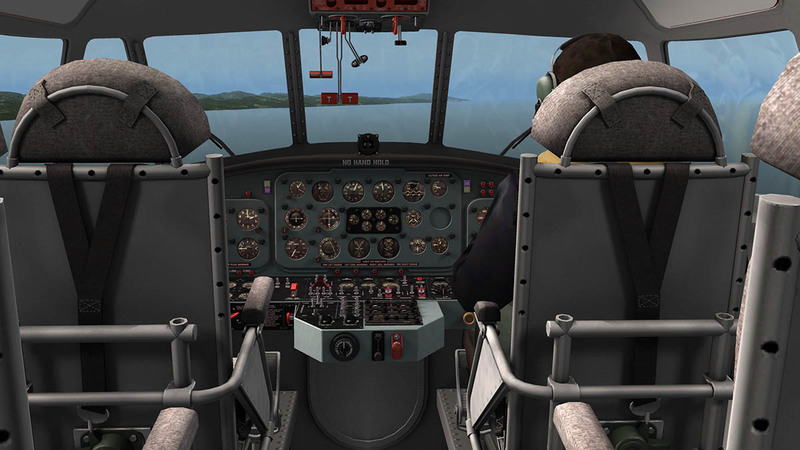 The cockpit, instruments and the flying controls are also placed and used for this same role requirement. The cockpit is WW2 late war-post war designed and kitted out. 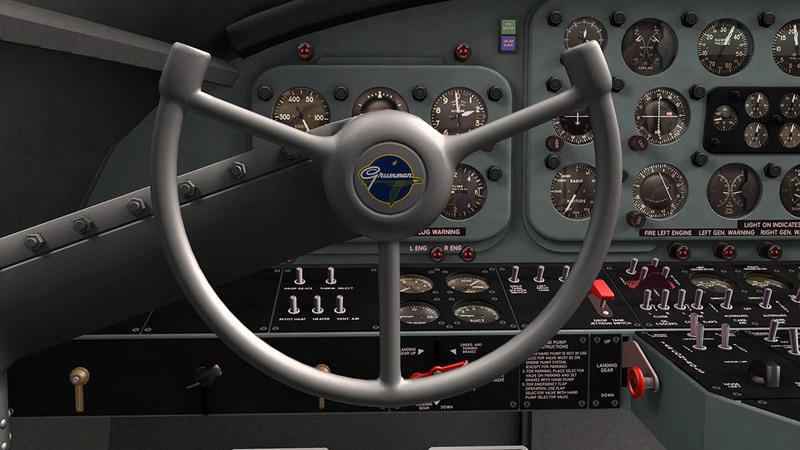 Khamsin's interior design (His B25-Mitchell was excellent) is always one of his major strengths and he does not disappoint here. 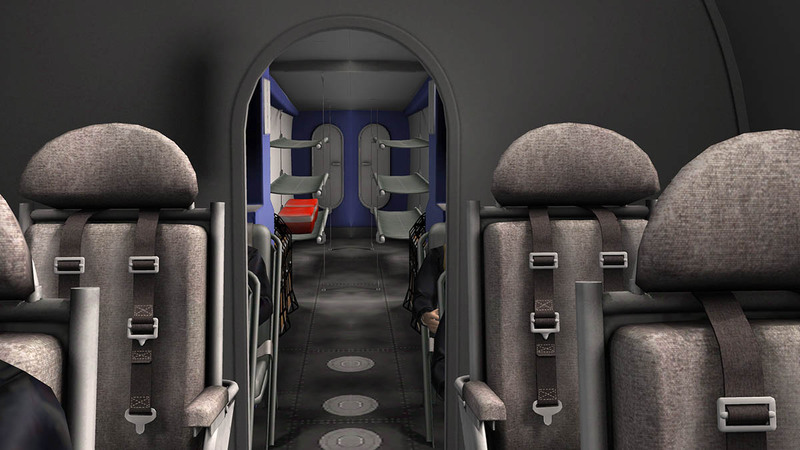 It is a great design of tubular seating and metal paneling detailed cockpit. The main panel is perfectly recreated with all the correct gauges and dials and sets of switches for about everything you will need to fly a long distance flying boat. 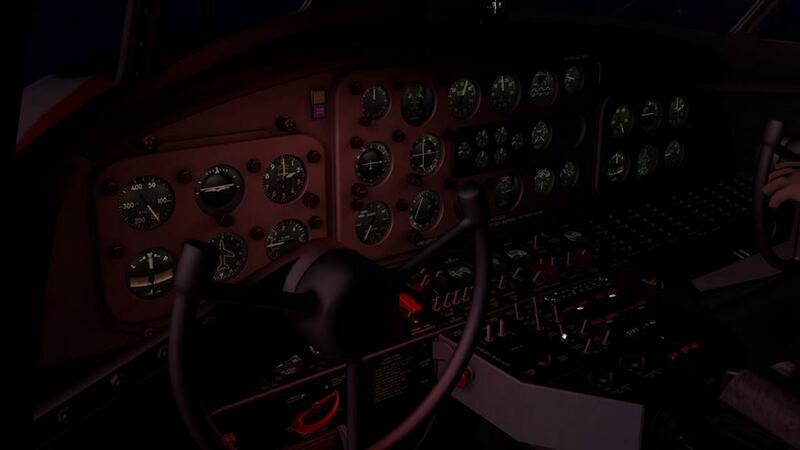 Two Clocks (one in real time and one timer) - Carb temp (left and right) - Manifold pressure - Tachometer - Wheels and flaps Position indicator - Outside Air Temp - ADF pointer - VOR 1/VOR 2 pointers - Radio altimeter - Cylinder head temperatures - Fuel Qty - Rudder and Aileron Trim Tabs Position Indicator. 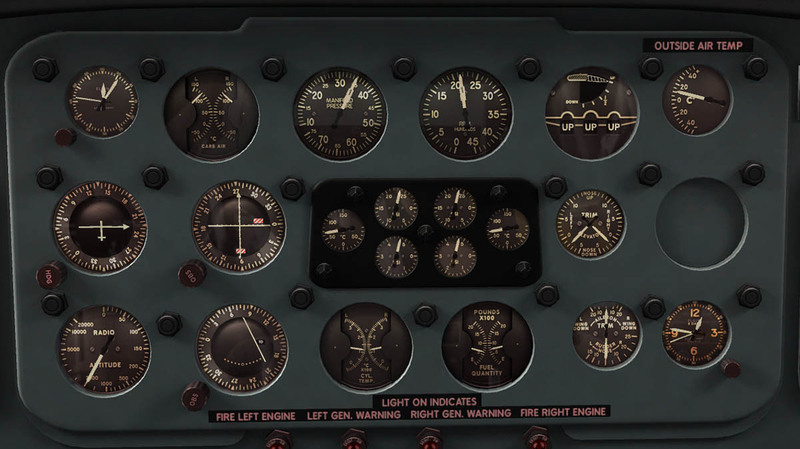 Centre in a separate black panel are mostly pressure instruments of - Oil temp left and right - Oil pressure left and right - Fuel pressure left - Fuel pressure right. Above and positioned the on top of the glareshield is a standard compass. On a lower shelf on the pilots side is another set of gauges for the Hydraulic Main System Pressure Gauge - Hydraulic Sub-system Pressure Gauge and the De-Icing Wing and Tail Suction Gauge and Wing and Tail De-icer Pressure Gauge. The electrical panel is set centre on the shelf with Generator (left and right) and Battery Gauges. then on the right (centre) side is the Voltmeter and Voltage Selector switch. The shelf on the Co-Pilots side is the rows of fuses. Sticking out from the shelf is the pedestal console... Here you have the Radio sets of Garmin 340 Audio Selector - Bendix King KX155 COM1-NAV1- Bendix King KX155 COM2-NAV2 - Bendix King KR87 ADF - Bendix King KT76A XPDR (Transponder) - Bendix King KN62A DME. 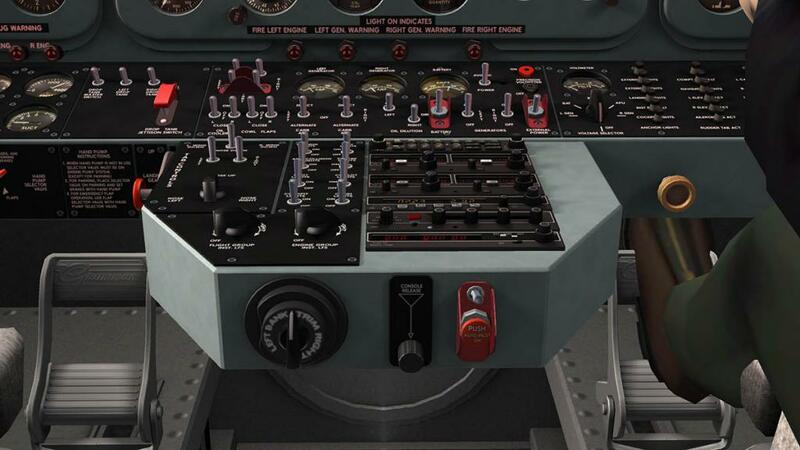 Aircraft lighting switches inside and out plus the instrument lighting knobs, and a TAB controller, which is an electronic trim TAB control. I wish the HU-16 had just the standard trim wheels, I found the switch version a bit awkward to use to find the correct trim, worse you would need to reset it back to neutral before landing. On the very rear of the pedestal is the autopilot. 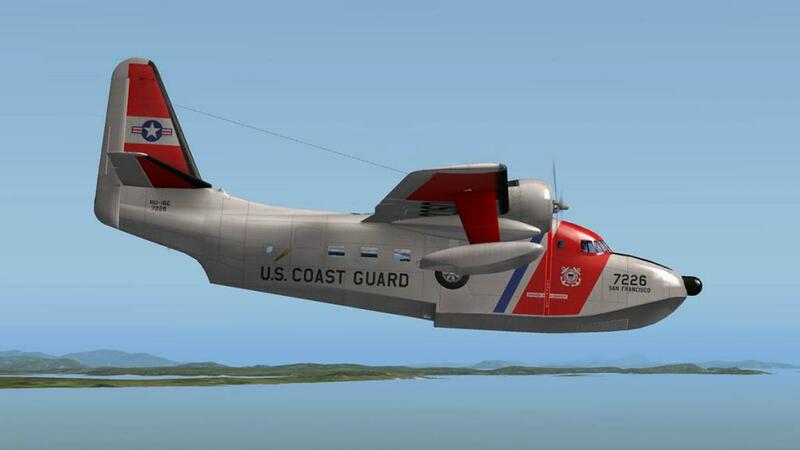 There is no doubt this system is used in the context of allowing the pilot to not have to worry about to many actions while flying the aircraft in a search scenerio. 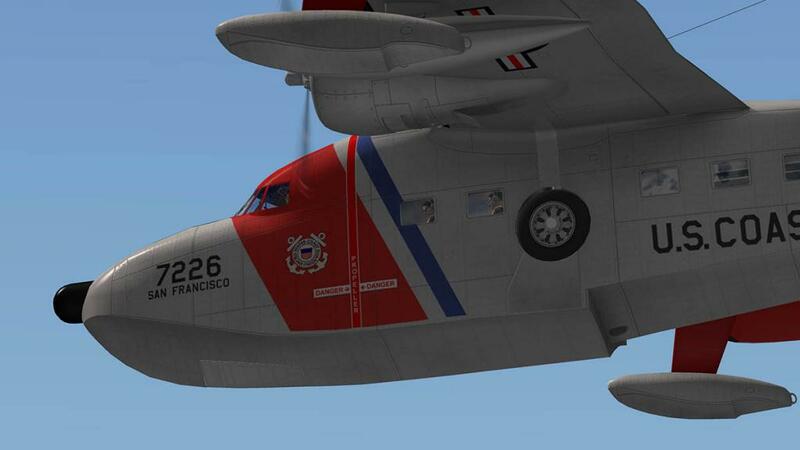 It does really only one thing, fly the aircraft at a set height and in the pointed direction. Up right on the roof is the "Overhead Control Panel" which is full of levers. 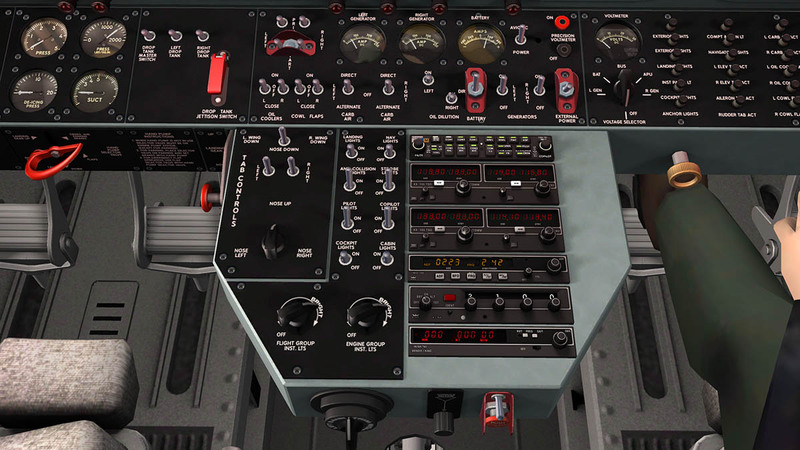 First is the red "Emergency Control Panel" or Fire panel which can dowse an engine if required (more so on these sort of aircraft). 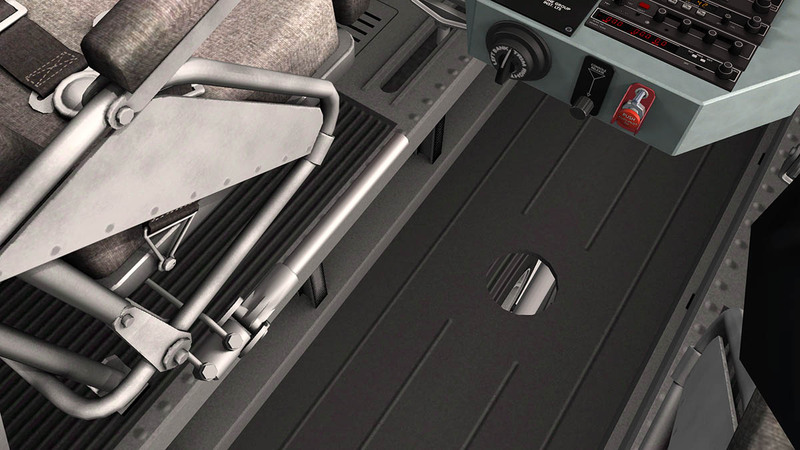 There are two large "Fuel Tank Selector Controls" or handles that switch to select the various tanks around the comprehensive fuel system. There are six tanks with two large ones with bladders in the wings 340 Gallons (2040lbs) per wing, One tank in each of the outboard floats 209 Gallons (1254lbs) in the right float and 212 Gallons (1272lbs) in the left and tanks in the two drop tanks which hold 304 Gallons (1824lbs) per drop tank. The main tanks replenish from the auxiliary tanks in a transfer system. In a failure you can go directly to which tank you require fuel from. If not required you can drop the drop tanks. 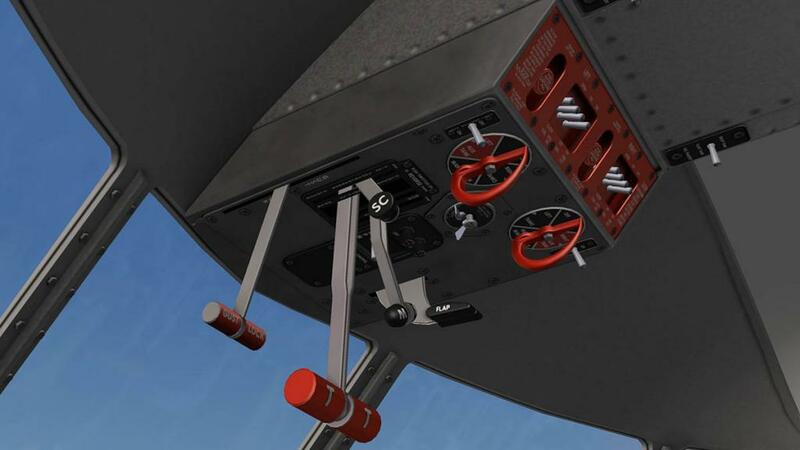 There are two Fuel Booster Pump Switches each side of the fuel tank selector handles with the Ignition Switches between them (fuel and electrical, ignition? that worries me) The ignition switch unit is a two engine type, incorporating a master ignition switch plus an individual ignition switch for each engine. The master switch is marked PULL OFF. 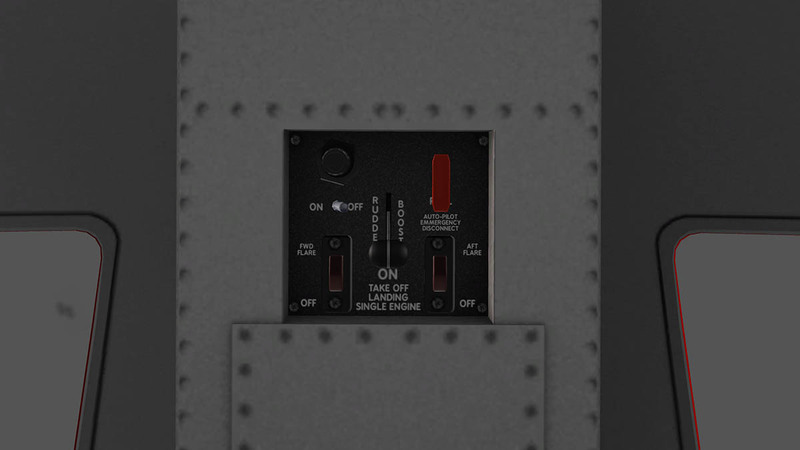 The master switch must be in the on (pushed in) position for the individual engine switches to operate. Each engine switch has four positions which control the four circuit conditions available. The positions are : BOTH, L, R and OFF. The Flaps Control lever is on the right side of the OH panel. The flaps are in four settings in Up - 1/4 - 1/2 - 2/4 and Down. 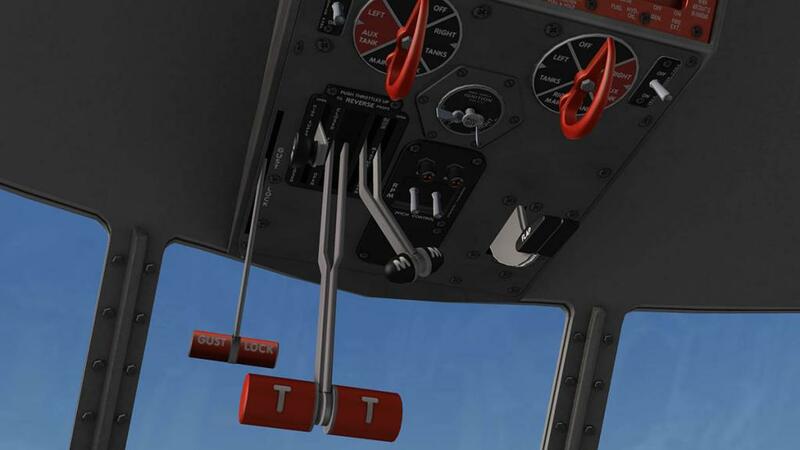 Propeller RPM Switches and Lights Two RPM control switches are for changing engine speeds by altering the propeller governor settings., These toggle switches (one for each engine) have three positions. The INCREASE and DECREASE positions are momentary, or spring loaded in the OFF position. 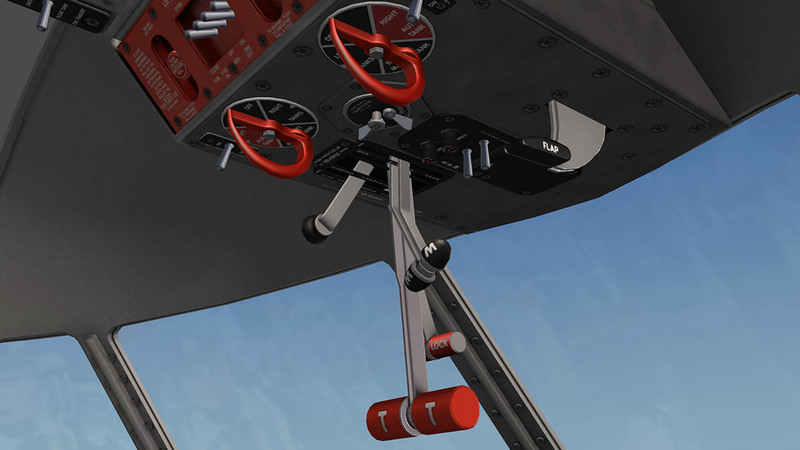 Standard Mixture Control levers (two, one for each engine) and engine shut-off. 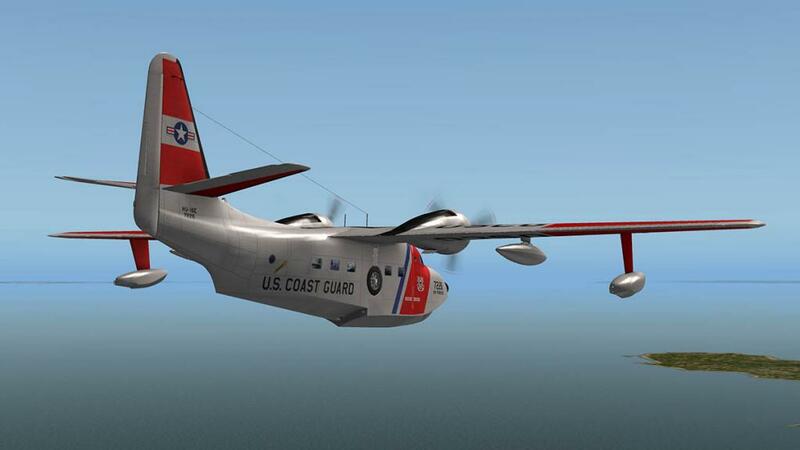 Throttles have built in reverse pitch and no safe guards, so be careful in flight not to activate the reverse. 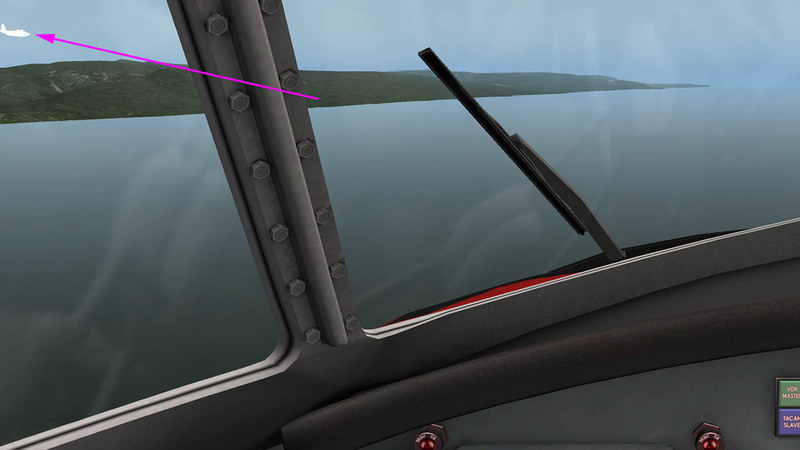 I found activating the reverse pitch on landing sent me off the runway to the right? but this (hopefully has been rectified in the v1.1 update), To turn on the water you use the throttles for each engine in the direction you want to go, It is tricky to do, but it can be done. There is a "Gust Lock Control" to lock all the primary control surfaces to neutral, i thought my joystick had lost connection with X-Plane when nothing moved, but I had the gust lock on (silly me). Final lever is on the OH is the Supercharger Control Handle. The Supercharger can give you a shove to gain altitude above 12,000ft as the lower range might not give you enough power to do so. 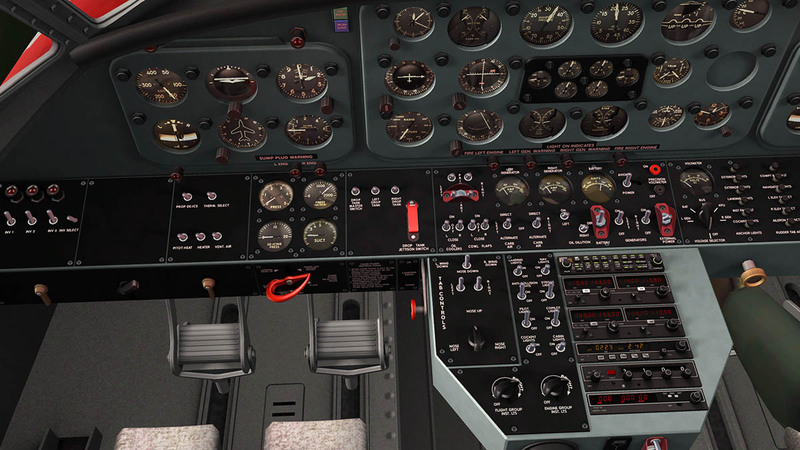 As with all items on an aircraft of this vintage you have to be gentle with the Supercharger or it might blow a gasket. 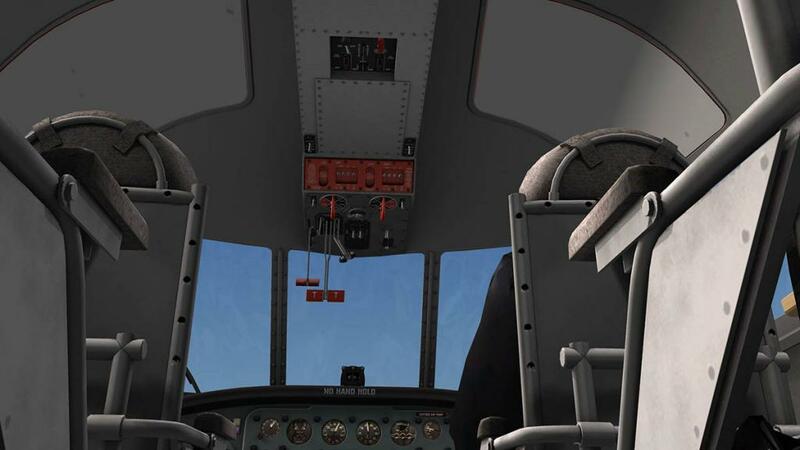 Hydraulics and systems (and sub-systems) are perfectly recreated and pressurised to 3000psi and there is a back up hand pump between the pilot's seat to get pressure into the system for the emergency operation of the landing gear, wing flaps, and emergency and parking brakes. De-iceing systems are also very well represented with both wing and tail de-icing systems, and windshield defrosting and defogging. High up behind the pilots on the roof is the rudder boost controls (not to used on Takeoff, landing and single engine flight) and FWD and AFT flares. The two yokes are a classical work of art. You can almost feel that cold round metal in your hands and the great Grumman badge in the centre. They can be hidden in the menus. 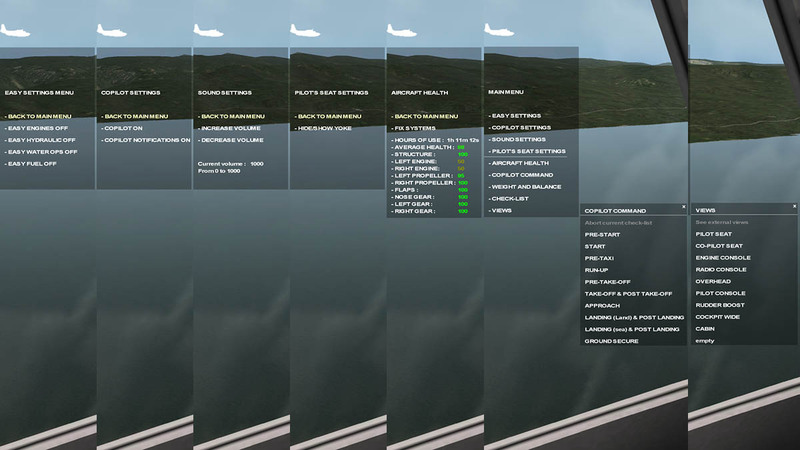 The menus are located under the white aircraft icon on the top left of your screen and are quite comprehensive. 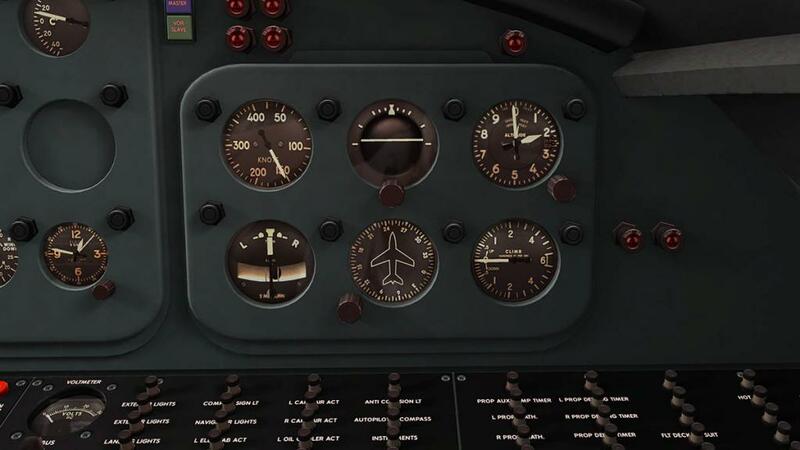 There are nine sections in: Easy Settings - Co-Pilot Settings - Sound Settings - Pilot's Seat Settings - Aircraft Health - Co-Pilot Command - Weight and Balance (manager) - Checklist - Views. Most menu items are mostly standard items with a few features worth mentioning. 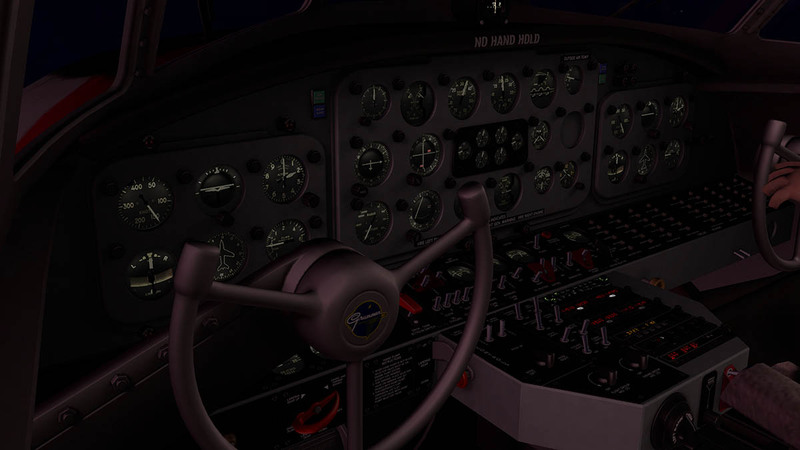 "Co-Pilot Notifications" are tag notices by the menu icon that say things like "I manage the engines, captain", It is your preference to keep them on if they annoy you, but sometimes relating to the engine performance they can be very helpful. 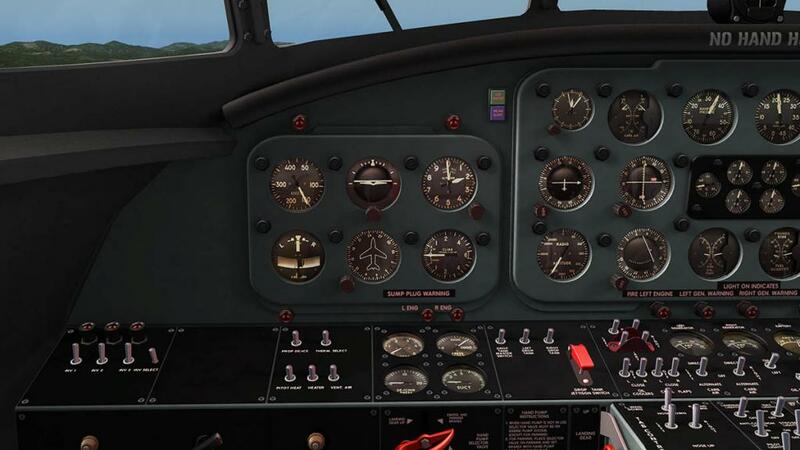 Aircraft Health is showing you the condition of the aircraft, the engine heath (L&R) will start around only 60% and either go down if you abuse them or go up to 100% if you look after them (or coax the best out of them). 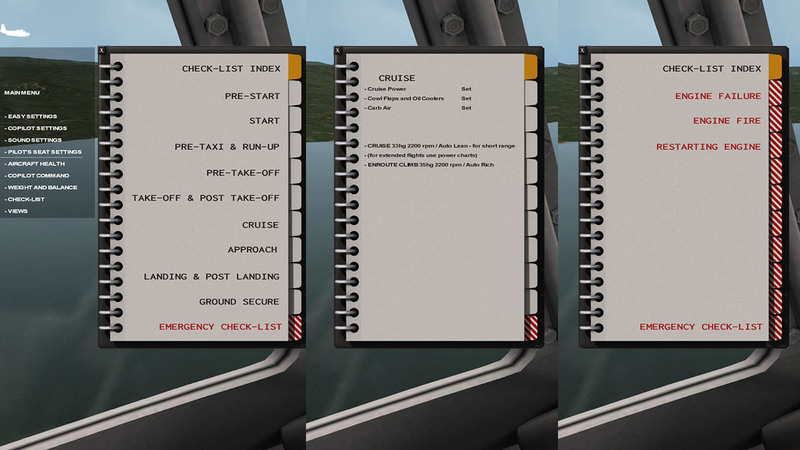 Co-Pilot Commands are a run through of the checklists and the Co-Pilot will do what the checklists state, great for starting up the aircraft or shutting it down, and the actual separate visual checklists are excellent with a clever "Emergency Checklist" section. 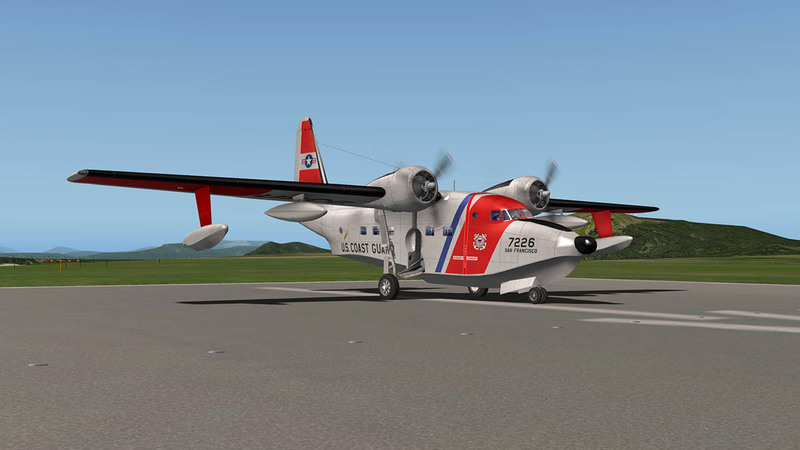 The Weight and Balance section is great for knowing where you fuel loads are and the amount of cargo (weight) you want to have on the aircraft. 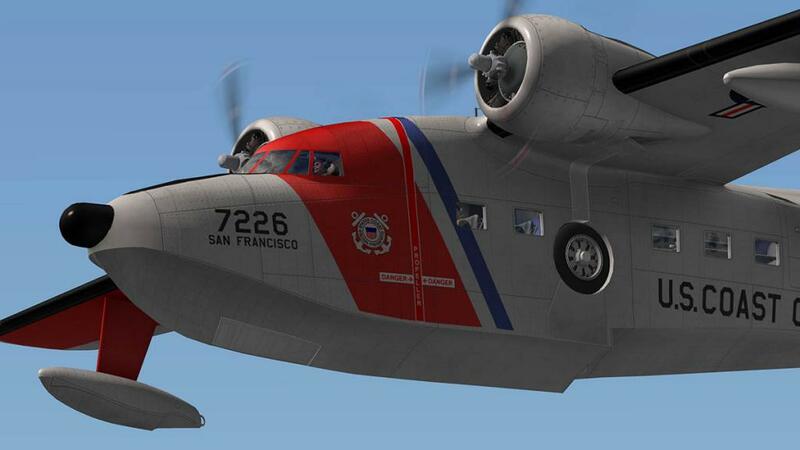 In many ways it is like the version from FlyJSim but not as comprehensive. As noted Khamsin does excellent internal cabins or rear cockpit spaces, and the Albatross is of no exception. 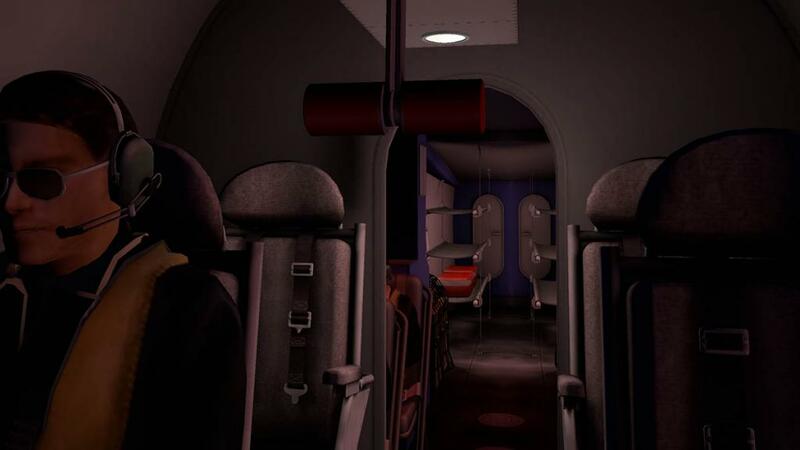 The aircraft is very well fitted out with emergency equipment and stretchers. 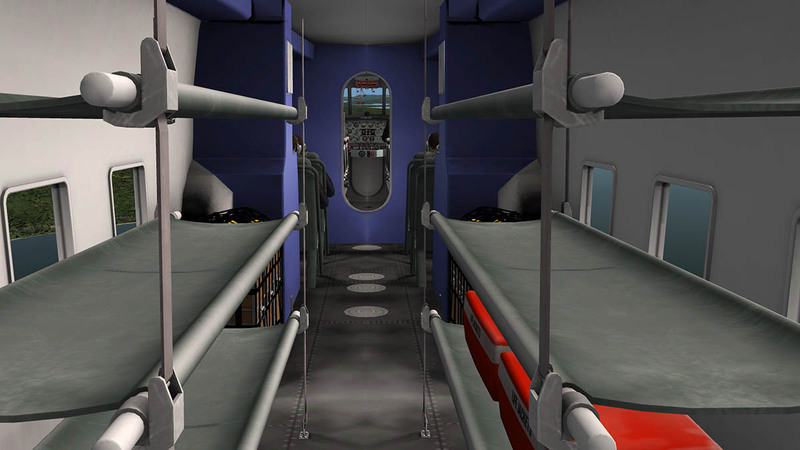 Four crew are placed in the forward cabin and are very realistic. Because of the watertight doors the cabin has a real nautical feel about it, it is a real shame there were no hatches that opened. There are four liveries - U.S. Coast Guard (default) - BUNDESMARINE - NAVY : 262 - USAF : N226GR. 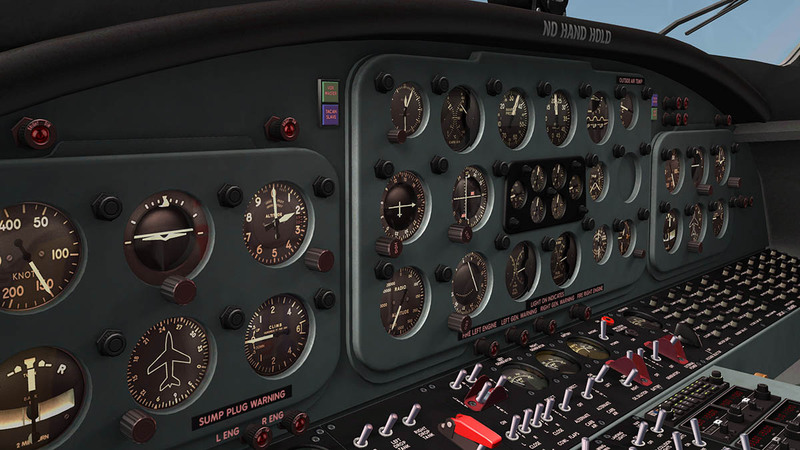 All are excellent and with great texture resolution (note the Xplane9® textures are only 2K were as the Xplane10® are 4K. 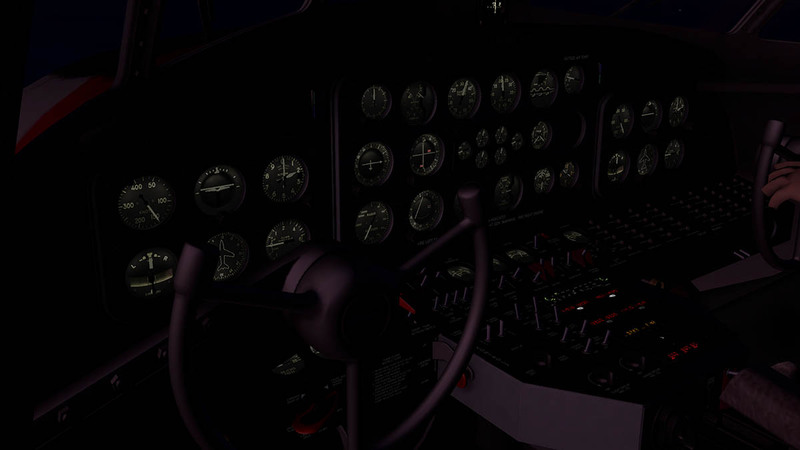 Cockpit lighting is simple but versatile and effective. The actual instrument lighting is excellent as the banks of dials glow magnificently in the dark, You have a separate red light over the pilots station and one over the Co-Pilots, and a single cockpit light overhead that gives you a great but not overwhelming light on the instruments. 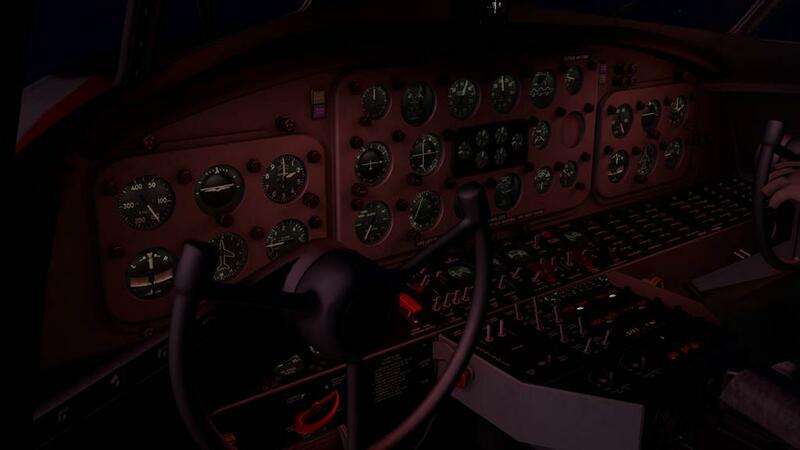 Using the four adjustments you can created many different feelings in the cockpit of which all are very good. In the rear cabin it is also well lit but with just one switch on or off, but again it on how you use the lighting in if you want the cockpit dark and the rear section bright or the other way around... it all works. Exterior lighting is minimal but good. 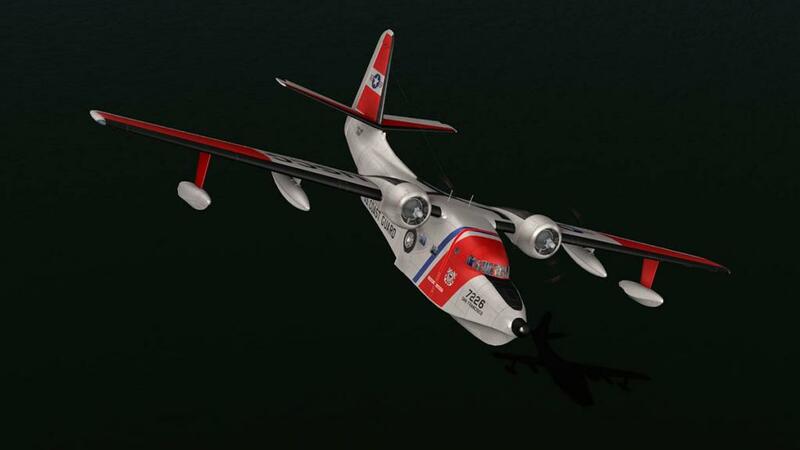 There are two drop down landing lights in the wings, Nav and strobe lights and a red beacon set low before the tail. 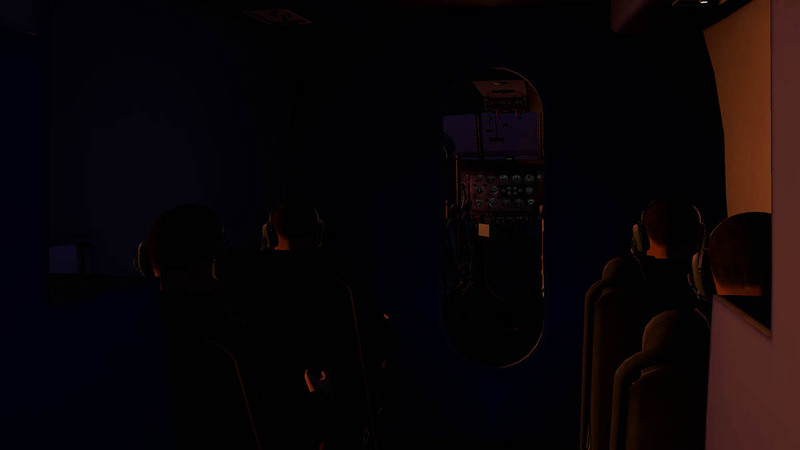 At night the cabin and cockpit glows and looks very realistic in flight, the early morning light highlights the excellent reflections on the windows. 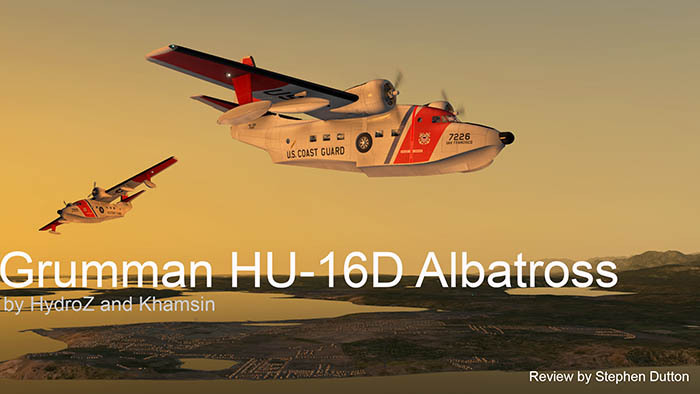 For all its bulk the HU-16D Albatross is quite a nice aircraft to fly. 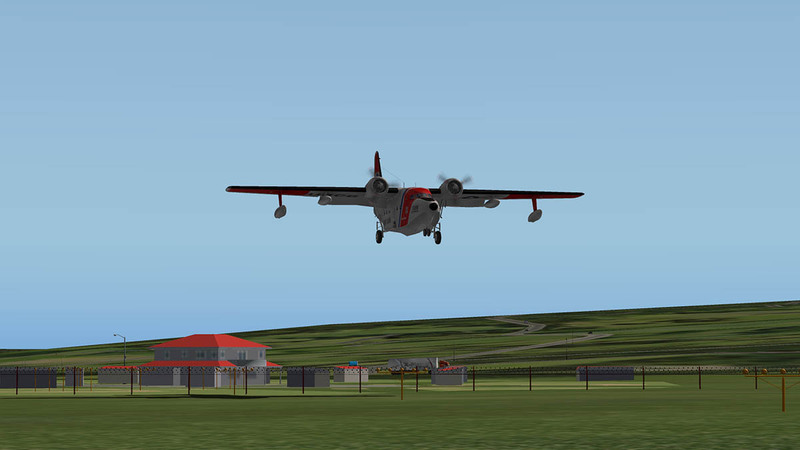 It is a STOL (Short Takeoff and Landing) so any flap will get the wheels off the runway in quite a short distance, Full throttle you do have a lot of power and you can climb easily at around 1200fpm, but cautiously (5 min max). 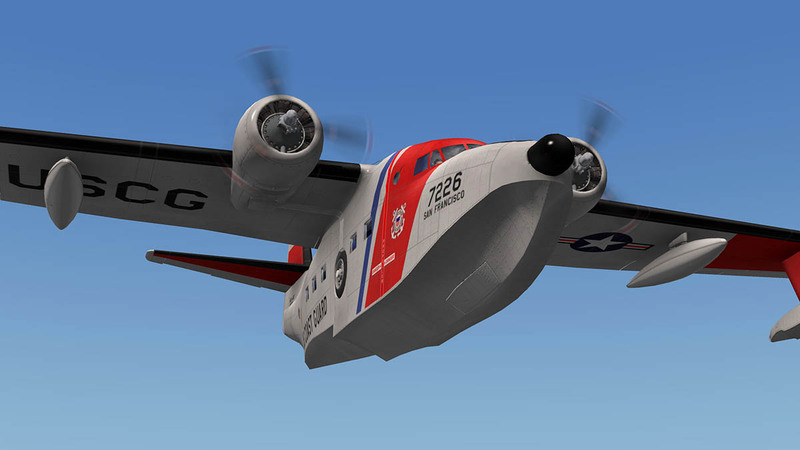 The Grumman is an old aircraft and those decades old engines have to be lovingly coaxed and willed to perform. Push them hard at full throttle and they will burn out really, really quickly and you are out of business before you have even started. Gauge your throttle at only 1/4 of its travel and even 1/2 throttle is going way over the limit and you will stay in the safety zone. Your Co-Pilot will let you know if you leave on the "Notifications" in that the best speed for "Max" speed and the best speed for "Cruise" at around 150knts, and if you keep to that you will be fine. You're eyes are on the "manifold pressure" on those two nine cylinder Wright R1820-76A/B/C/D engines as you can't have a "high" manifold pressure or either a "low" pressure either, but only that sweet spot in the middle at 35%. 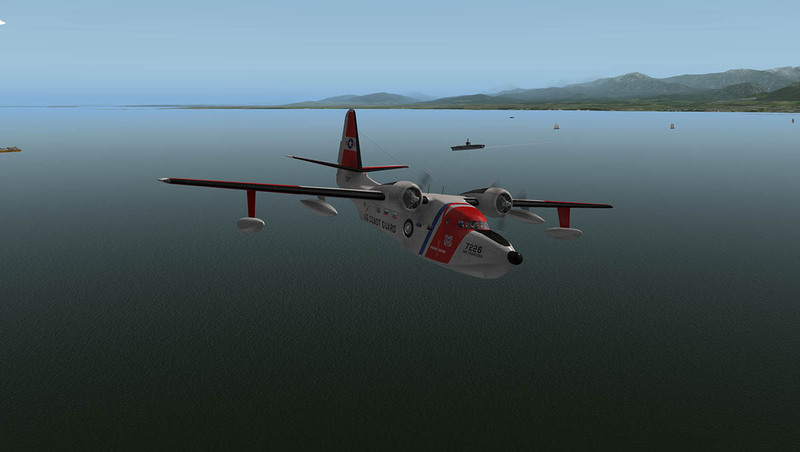 Flying around on station the aircraft surprisingly light to fly. 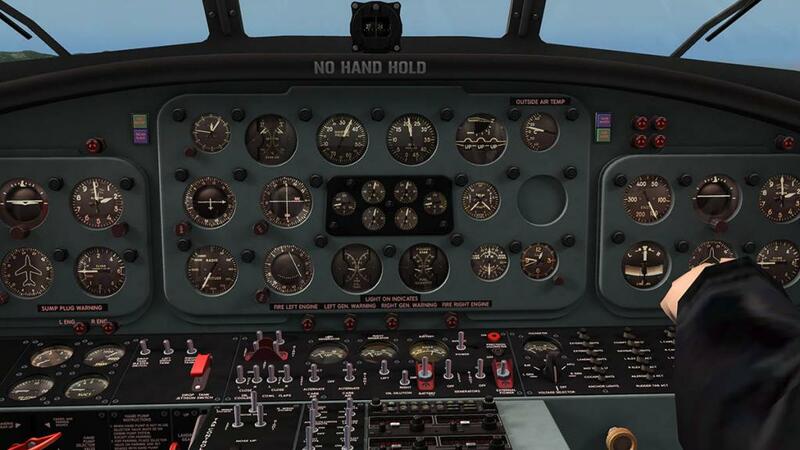 Just a forefinger and thumb is required to keep the aircraft doing what you want it to do. So once you set yourself up in cruise you will find yourself enjoying the flying. 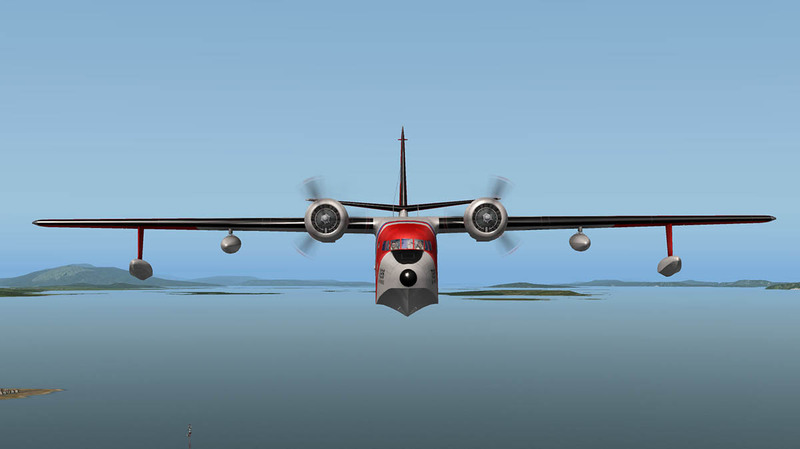 The aircraft does fly slightly pitch down, I tried the TAB system to try to trim the aircraft better, but it didn't like that and just climbed slightly, so I just let her be. 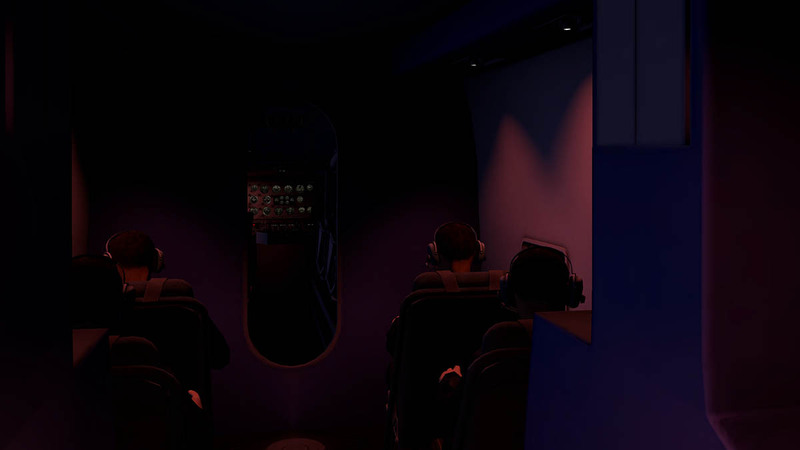 Sounds (especially in the cruise) are excellent, They don't drone too much but give you a comforting background to your flying in the cockpit. The stutter and fire at startup and power ranges are all excellent, so you can't really fault any of the sounds. 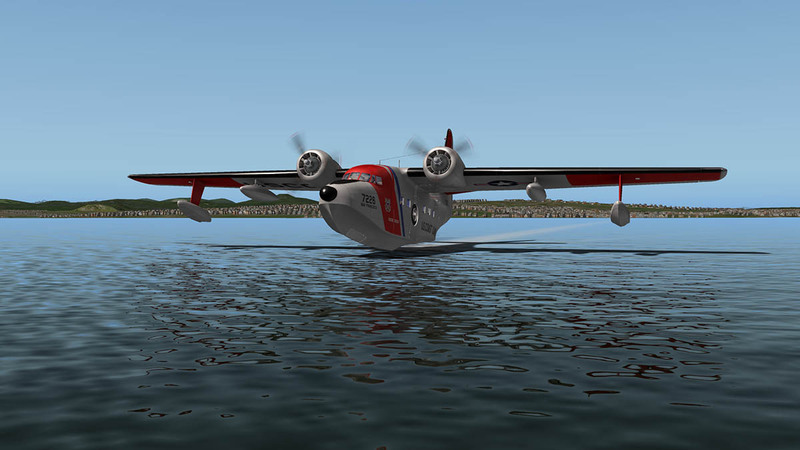 Landing and taking off from the water is very good, The low 70knt full flap speed will be very close to the stall speed, but you can get that just right without losing height before touching the water. 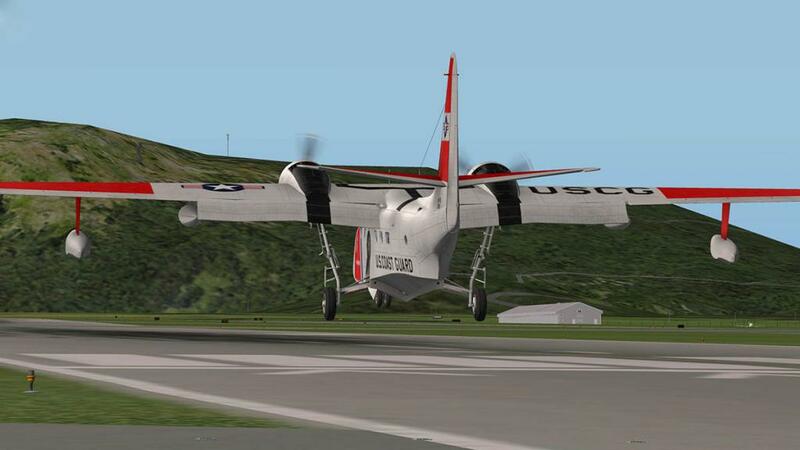 Taking off is a skill to be learned, It is your choice to use a small flap drop, but in this case I don't... 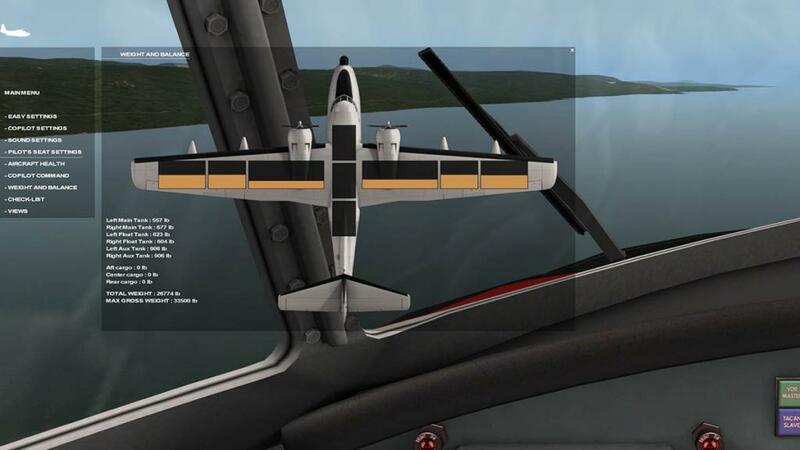 The problem from taking off from water is the drag to speed range, any flap will take off any speed that you will need to get airbourne, So I go for a very long ride and build up the speed with zero flaps, once the ground effect kicks in and the aircraft will rise a little out of the wetstuff the drag will start to disappear and then you can find a decent vertical speed and away you go off the water. 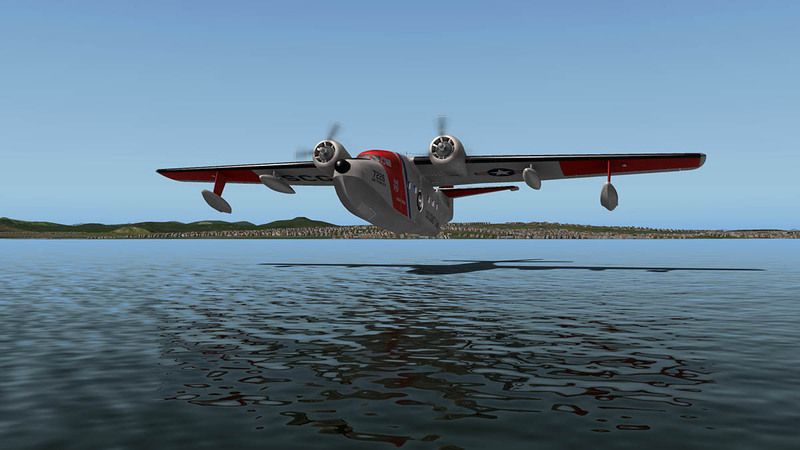 Some aircraft require flap to start and then once they start to lift out of the water you pull the flap up for the speed, but here in the HU-16D I didn't try those tricks. Landings will require a little skill. 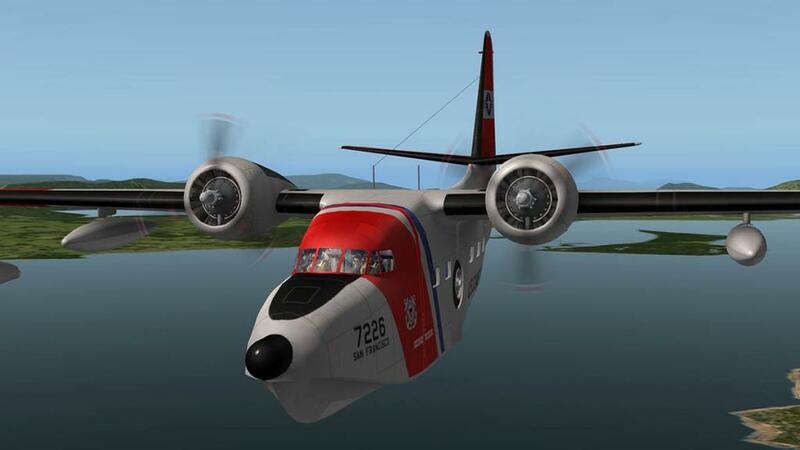 You need as much a low speed as you can get, and under full flap at 70kts you are again managing the speed to stall zone. Your approach needs to quite flat as well as the issue is the travel on the main gear is quite high. Get the descent too fast or too steep and those wheels will be so compressed then go straight into a rebound that will send you flying again. Even a slightly wrong landing will send you bouncing around like you are sitting on a skyhopper. The trick is a slow and very flat approach and a touch of getting the rear wheels softly down on to the tarmac. 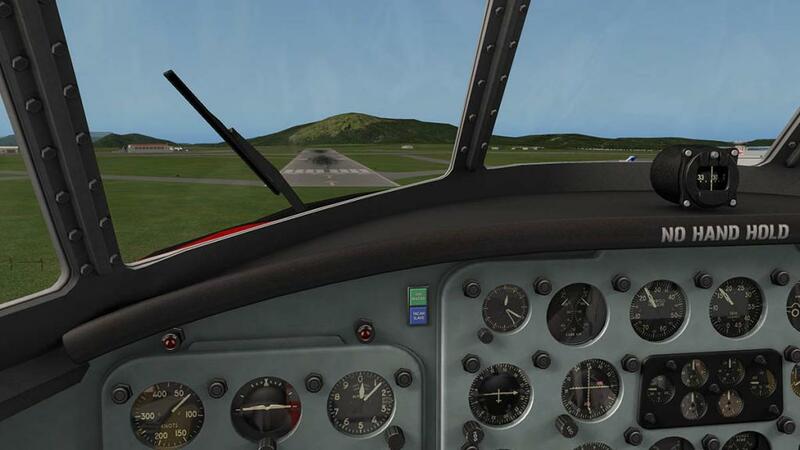 As the speed is very slow then a short braking zone is all that is required, as noted on this earlier version a reverse of pitch will just sent you to the right and off the runway (fixed in the v1.1 update). Aircraft like the HU-16D Albatross are interesting to fly and master. 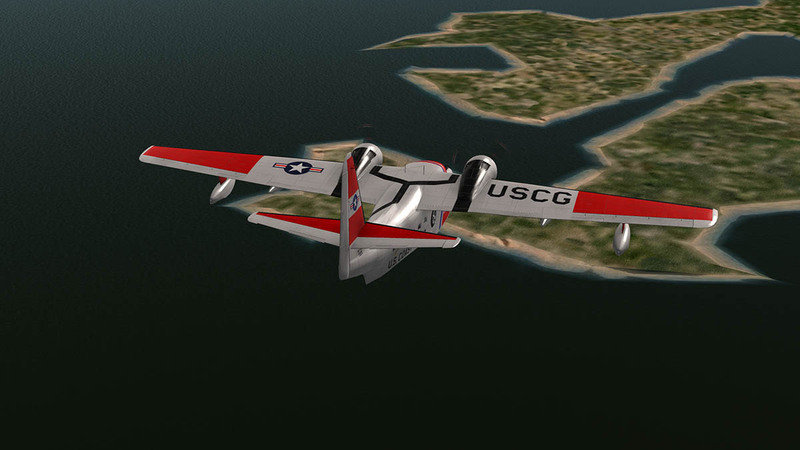 This version comes with a lot of (old fashioned) systems and flying skills. 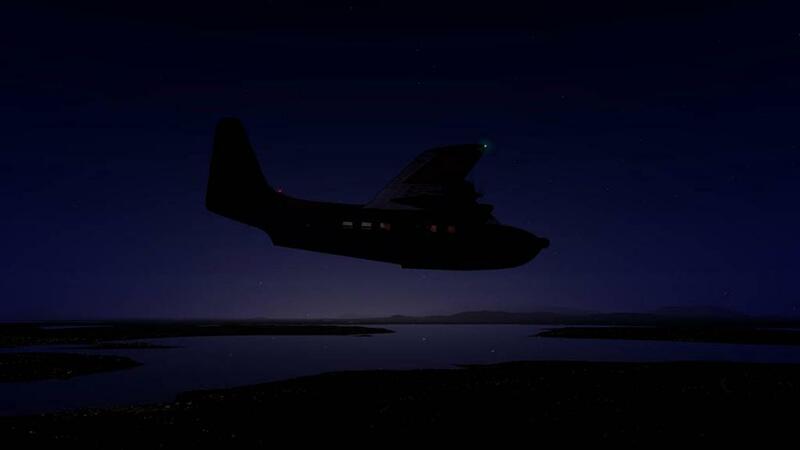 But it is a great aircraft to fly and it can be flown on missions that are very different in range and profiles. Go island hopping or looking for that island way out in the Southern Atlantic or Pacific Oceans it is a very versatile aircraft. 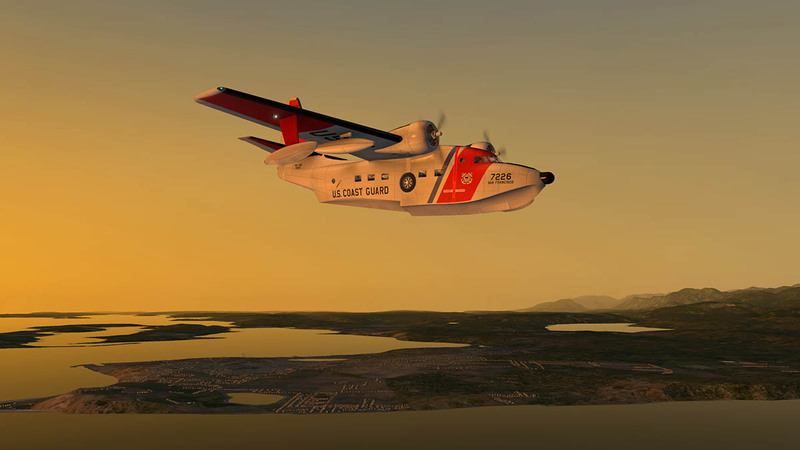 Flying is for the long distance and the on station mission aspect and the aircraft and controls are designed for that operational capabilities, great autopilot - pilot interaction. 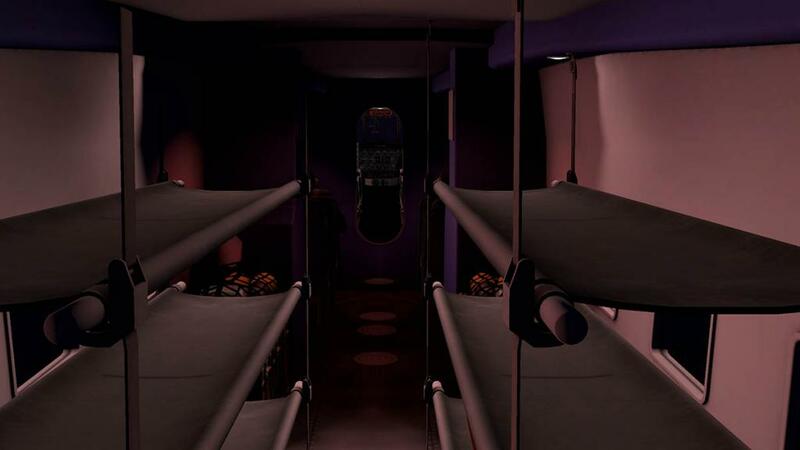 The aircraft is very well created by both HydroZ and Khamsin. 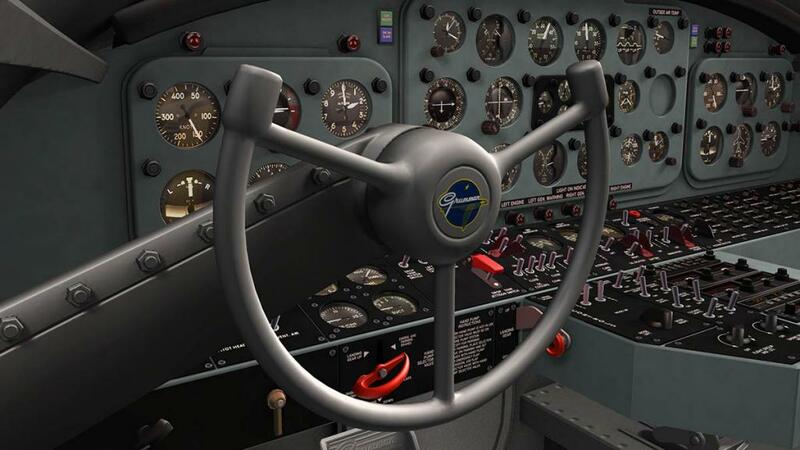 That cockpit and beautiful panel work is excellent in design and as a reproduction of such an iconic aircraft. 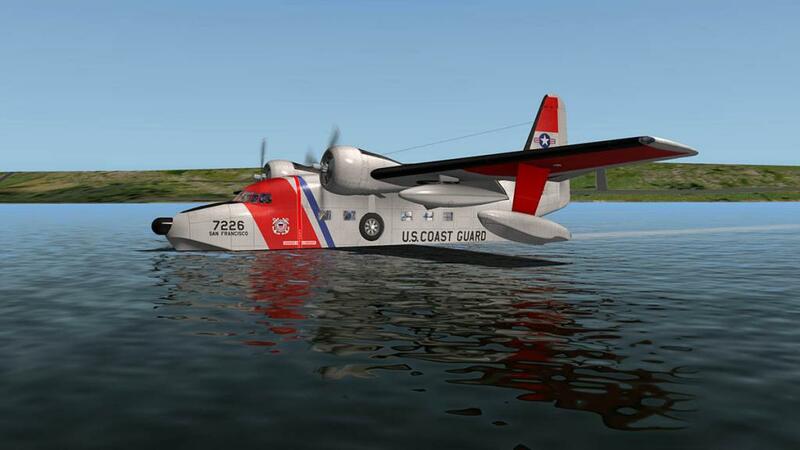 Water operations are excellent and the systems depth in realistic engines failures - engines mixture settings - fuel management, including drop tanks - Realistic systems behavior - Hydraulic systems - Cold weather and De-icing are all covered. 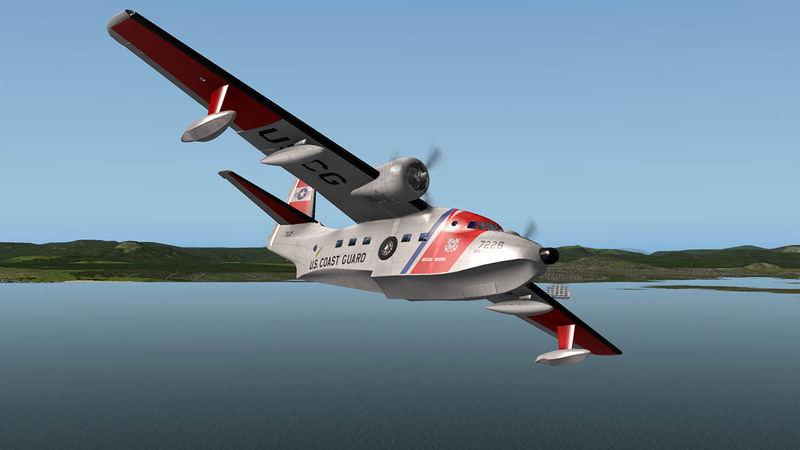 And it is available for both Xplane9® and Xplane10®. Only short cut is the none operating doors or hatches. 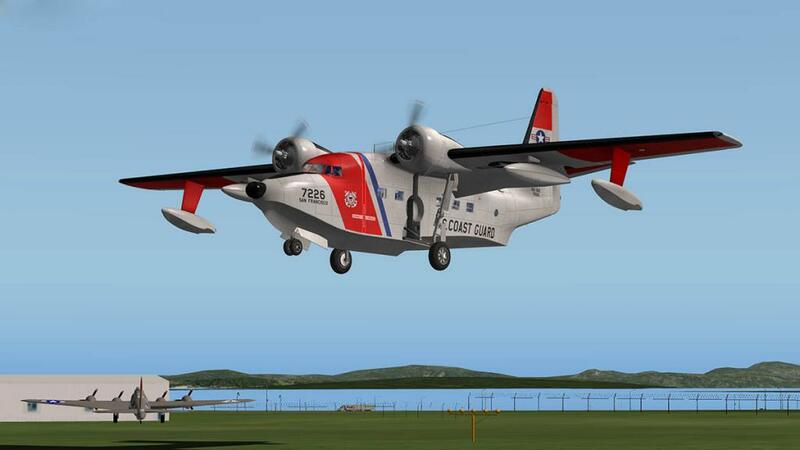 So as an investment it is great value, great quality design and the Albatross great aircraft to fly and is highly realistic in operation. Yes a certain winner from HydroZ and Khamsin. Installation and documents: Download is 162.10meg and the aircraft is deposited in the "Seaplane" X-Plane folder at 212.30 meg. 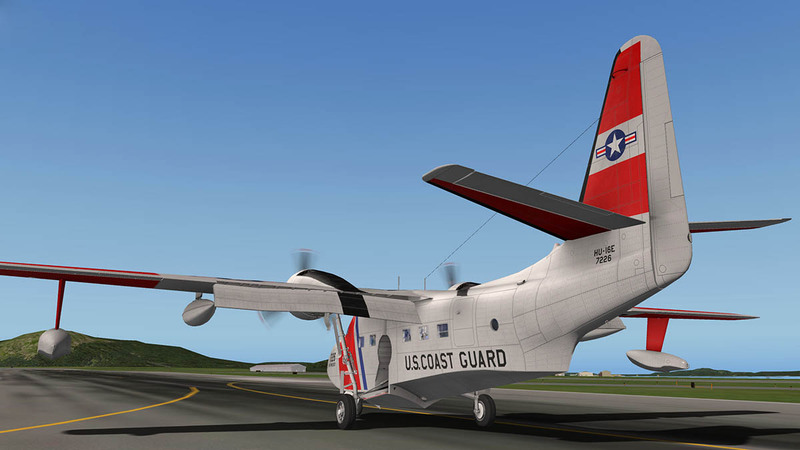 Details on how to convert the aircraft to Xplane9® are included. 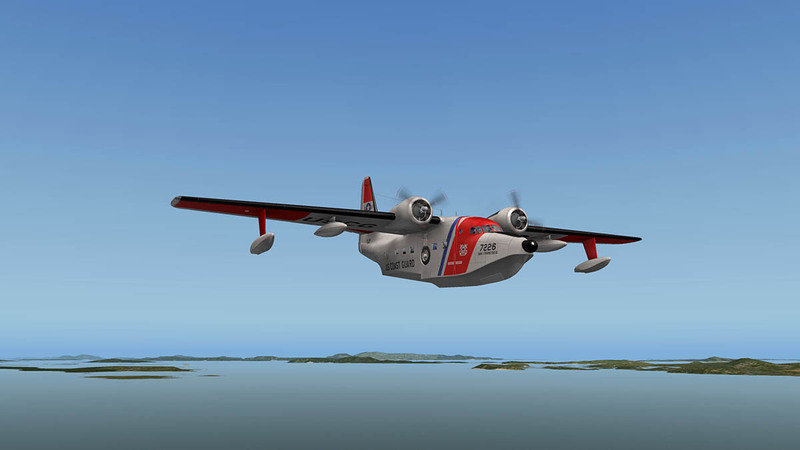 Make sure the aircraft is the updated v1.1 version. 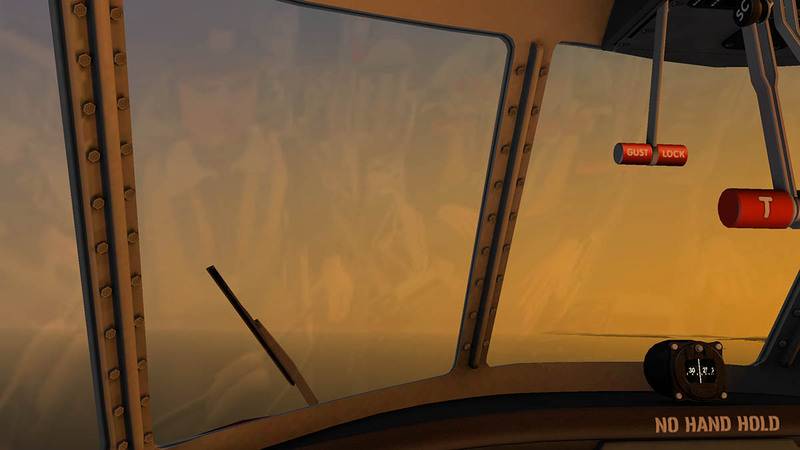 How to remove the co-pilot? How to make sure that the version 1.1? How to assign a keyboard key for switching ON and OFF the red button autopilot? I did as you wrote, but I did not succeed. Your right it doesn't work... I checked other keys as well that could do the same function? I'll check it out.